Turkish Prime Minister Ahmet Davutoglu speaks in Mardin, Turkey, Feb. 5, 2016. Turkey’s complicated and controversial fight against Kurdish factions at home and in Syria is making its battle against the Islamic State group more difficult. It also leaves Ankara in a weakened stance to combat terror, analysts say. "That position leaves Turkey less able to devote resources to fighting IS and halting the flow of fighters across its border, even if it is inclined to do so," said Alan Makovsky, a former U.S. State Department official and Turkish affairs expert at the Center for American Progress. Turkey is reeling from recent terror attacks blamed on IS militants. In all, more than 150 people have died in IS-related terror incidents in the last six months. Turkey has tightened its borders against IS infiltration and has stepped up arrests of IS suspects. At the same time, Turkey has been fighting against Kurdish militants known as the PKK in eastern Turkey, where battles reignited last July. Across the border, Turkey sees Syrian Kurdish forces associated with the Democratic Union Party (PYD) and its military wing, the People's Protection Units (YPG), as enemies, even though these forces are helping a Western coalition fight IS in Syria. A fighter from the Syrian Democratic Forces takes a position atop Mount Annan overlooking the Tishrin Dam, after they captured it from Islamic State militants, south of Kobani, Syria, Dec. 27, 2015. Ankara is facing international criticism from human rights groups over its harsh crackdown on Kurds in eastern Turkey. And Turkey’s leaders are facing strong internal pressures from opposition groups who claim they have not done enough to combat IS. In some instances, opponents claim, Ankara’s policies have supported IS aims and left Turkey vulnerable to IS terror. Makovsky told VOA that Turkey's first priority is fighting the PKK and, to the best of its ability, limiting the expansion in Syria of the PYD, which it considers largely an extension of the PKK. And that leaves Turkey with a diminishing capability to combat IS, said Ali Akel, a journalist and commentator in Turkey. "The Turkish government seems to think that it has to fight the PKK. 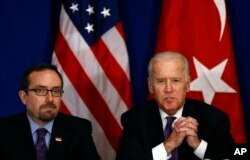 So the IS issue gets moved aside," he told VOA. FILE - A police vehicle is seen in front of the U.S. Embassy in Ankara, Turkey, June 22, 2013. Still, Turkey is an important ally in the Western coalition’s fight against IS in Syria and Iraq. Ankara allows coalition warplanes to conduct bombing missions from a Turkish airbase. And coalition forces have been working with Turkey to tighten its borders. U.S. Vice President Joe Biden visited Istanbul last month to urge Turkish officials to continue their fight against IS despite Turkey's political and military dilemma. The PKK, branded a terrorist organization by Ankara and Washington, has been fighting for Kurdish political and cultural rights in Turkey since 1984. But the U.S. supports Kurdish forces fighting IS in Syria. A women and her children stand in the ruins of battle-damaged house in the Kurdish town of Silopi, in southeastern Turkey, near the border with Iraq on January 19, 2016. That difference is affecting Turkey’s ability to help the U.S.-led Western coalition fight IS, analysts say. “If Turkey does not solve the Kurdish issue peacefully and keeps attacking the Kurds, the U.S.’s Syria policy in general and the IS policy in particular will be more difficult to implement,” Gonol Tul, the founding director of the Middle East Institute’s Center for Turkish Studies, told VOA. Iraqi Prime Minister Haider al-Abadi said recently that Turkey needs to change its aims. "They have to shift their priority from considering the Kurds as their problem to IS as their major problem," he said, according to the Kurdish Rudaw website. Ankara has long been criticized for "looking the other way" with respect to IS activities and networks in Turkey. But as IS terror has increased, so has the need for Turkey to fight IS, he said. “IS is the first enemy of Turkey in Syria,” Yasin Aktay, a member of the Turkish parliament from the governing AKP party, said this week in Washington. U.S. Vice President Joe Biden, right, accompanied by the U.S. Ambassador to Turkey John R. Bass, talks during a meeting with Turkish civil society groups on first day of his visit to Turkey, in Istanbul, Jan. 22, 2016. The U.S. says Turkey is a willing and cooperative partner in the coalition's fight against IS. And Ankara says the U.S. must understand the Turkish dilemma.